How committed is Mitsubishi to the U.S.? Is quitting an option? People have been asking me for the past six years whether Mitsubishi's going to withdraw from the market. But it never enters my mind. ... We have never thought about withdrawing from the U.S. market, and we will not do so. Mitsubishi Motors Corp. has fallen hard since its U.S. business peaked at 354,111 vehicles sold in 2002. In 2009, sales tumbled 45 percent, amid a 21 percent industrywide slide, to 53,986. In the first nine months of this year, sales dropped 3 percent to 41,392 in an overall market up 10 percent. 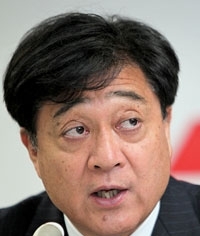 President Osamu Masuko faces a long list of structural problems at the carmaker's U.S. operations. Mitsubishi is struggling with an aging lineup of slow-selling, U.S.-made models such as the Galant, Eclipse and Endeavor. It is saddled with a factory in Normal, Ill., that operates way below capacity. And its more attractive import lineup is being hit hard by the yen's surge against the dollar. Masuko, 61, spoke with Asia Editor Hans Greimel last month through an interpreter about his market outlook, the impact of exchange rates and plans for electric vehicles and other new models. What's your assessment of the economy? For the 2010 fiscal year [which ends March 31, 2011], the global economy seemed to undergo a moderate recovery. This is what we were hoping for. But then came the financial crisis in Europe. And we thought the economy would pick up more in the United States, but it's not recovering as much as expected. So compared to our initial outlook, the reality is more severe. In this environment, what is causing us the biggest trouble is the appreciation of the yen. That is the biggest issue we have to overcome. How is the yen's appreciation affecting Mitsubishi? It's not just the yen's appreciation against the U.S. dollar. It's appreciating against the euro, the pound, the Australian dollar and the Canadian dollar. The losses we are experiencing in exports pose a very difficult situation for us. We are not able to raise prices that easily. The reason is the market is very competitive. What can Mitsubishi do about it? The Lehman shock of September 2008 had a big impact on the whole industry. Japanese automakers, including us, implemented emergency measures to cut costs and reduce expenditures. And we did as much as we could do. So there were no real big items left to cut or activities that would have a big impact. After all that comes the appreciation of the yen. So it's not easy to reduce costs or expenses, because we don't have any more room. We've done what we could. If you think about shifting production overseas, we cannot do that on a short-term basis. Of course, on a mid- or long-term basis, we have a strategy. But it won't help you short term. One example might be procuring more parts from overseas. That is something we could immediately do, and there's going to be an impact. How can Mitsubishi make better use of its U.S. plant? When we think about foreign exchange rates, we have to evaluate overseas plants in a different way. I really feel we have to make effective use of the plant. We are going to announce the fiscal year 2011 business plan by the end of this year. We will announce what to do with the U.S. plant at that time. I cannot speak about it too concretely, but from what we know at the moment, it is not possible to continue with the models that we have had. Your head of U.S. procurement and supply, Sandra Gillespie, just left the company. What kind of problems does that pose for your overhaul of the Illinois plant? She left the company because of personal reasons. That was not our intention. But just because she left the company doesn't mean there will be an impact in our policies. The top management in the United States has changed many times, including the CEO. It's not a big issue. As a company, we're not working as individuals. We're working as an organization. What are your U.S. sales goals this year and next? This year is better than last year. And at the end of this year, we are launching the Outlander Sport in the United States, and we expect better results next year when it is counted in a full year of sales. Sales were 54,000 units in the 2009 fiscal year. In the current 2010 fiscal year, it will be 68,000 units, including the Outlander Sport. And fiscal year 2011 will further exceed this number. Mitsubishi's U.S. sales peaked at 354,000 in 2002. What accounted for the tumble? First of all, the overall market has shrunk. But we also took very active sales expansion policies. One or two years of those led to great losses that we didn't forecast. In the past we were engaged in fleet sales and incentives. We sold vehicles with zero or low interest rates. What we learned is that we should not be selling vehicles in a way that is not an ordinary practice. Now we are driving our business very safely. You have to do business that fits your own size and capabilities. You shouldn't try to overstretch yourself. What is the right size for Mitsubishi in the United States? At Mitsubishi, we're always talking about what the best scale for our sales in the United States would be. We haven't really come up with a conclusion. But my personal opinion -- I don't know how many years it would take -- is our target could be around 200,000 units. If we sell 200,000 units, we could probably produce at least 100,000 units at the plant in the United States and import 100,000 from Japan. This would help secure a minimum level of volume in the United States. How will you improve U.S. sales? To rekindle the U.S. market, we are introducing an electric vehicle next year and then a plug-in hybrid after that. We are very much oriented around environmentally friendly technologies. This is one of Mitsubishi's new pillars for penetrating different markets. What other green technologies is Mitsubishi pursuing? We have developed a next-generation clean diesel engine and just launched the product on Sept. 16. Society is demanding green technology from us. And when we look out 10 or 20 years, it is important for us to have this technology to retain a place in the industry. Because we have been developing and producing electric vehicles, we were able to acquire a lot of new technology. We would like to apply technology developed through our electric-vehicle program to our gasoline and diesel programs as well. Will Mitsubishi bring its diesel engine to the United States? We could, but I believe diesel isn't so popular in Japan and the United States. How difficult will it be for Mitsubishi to meet the new U.S. corporate average fuel economy regulations by the 2016 model year? The new CAFE is very stringent and requires a high level of technology. It is a very difficult challenge for us and the entire industry, but we strongly believe we can handle it with the present technology we have. Up until 2016, what we want to do is enhance our use of continuously variable transmissions, reduce weight and reduce air and rolling resistance. After 2016, the regulations will get tighter, so we would like to introduce electric vehicles or plug-in hybrids. What are your expectations for incentives and marketing in the United States this year? Incentives came down by about $270 per vehicle in the first quarter of fiscal year 2010 compared with the previous year, but the average incentive per vehicle still exceeded $3,000. But we'll be introducing a new car soon, so the total year's average incentives should settle somewhere lower than $3,000 per unit. What effect will the Outlander Sport have on the brand's profile? The Outlander Sport is selling well in other countries, so we have high expectations for the United States. As it is well-received, brand recognition will further improve. And this means there will be an impact on other models. To accomplish this, we're hoping that total industry demand won't drop and will stay around the 12 million level, or at least 11.5 million. We have even higher expectations for 2011. We want it to exceed 12 million. What is the status of your U.S. dealer network? There are about 400 dealers in the United States right now. First there was the Lehman shock, and then came the problems at the Detroit 3. So dealers have undergone a lot of reshuffling. Some dealers have left the Big 3 and joined Mitsubishi. So the overall number of dealers has not increased or decreased much. But new and capable dealers have joined Mitsubishi, so we have high expectations. I am sure the introduction of new models, including the environmentally friendly i-MiEV electric vehicle, into the American market will contribute to the revitalization of business.